Topics covered within this workbook include place value and decimal places, exploring multiplication, methods of multiplication, division and calculation families, using inverses and finding missing numbers, rounding numbers, negative numbers, binary, roman numerals, brackets, prime numbers, square numbers and cubed numbers. Each section begins with Teacher’s notes followed by photocopiable activity sheets. As with Years ¾, an introductory page is included establishing the robot theme and the digibot motifs used throughout the workbook. The current Maths curriculum has increased emphasis on arithmetic and the different ways calculations can be made. This series will help support teachers and pupils as they get to grips with different techniques while still injecting some fun into maths lessons. 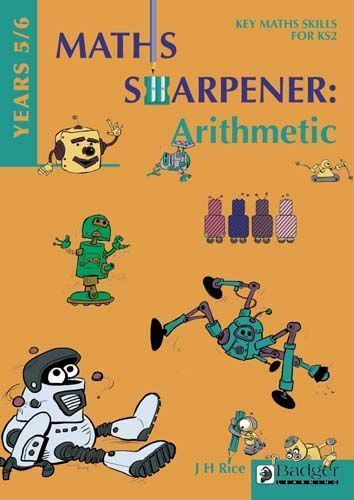 The Maths Sharpener series provides structured arithmetic practice presented in a clear format. Set in an android world, Big Head the robot and his digibots will steer your pupils through standard forms of calculation to develop their proficiency and confidence. Fun drawings and activities strike a balance with carefully constructed exercises to scaffold pupil learning.